Two hollow concrete columns, one housing a boiler and the other hoisting gear, carry a concrete tray containing 10,000 kg. of electrical plant. The W-shaped roof is suspended from a concrete yoke to allow a view unobstructed by columns of the rails from the glazed compartment above the tray. 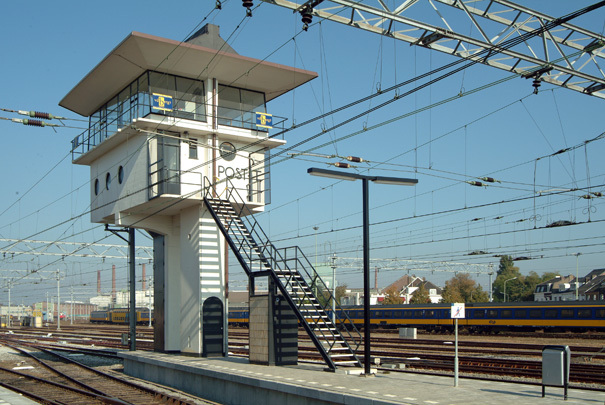 This is the sole survivor of a clutch of signal boxes Van Ravesteyn built in his capacity of architect to the Dutch Railways.